Wow. what a gruesome weekend!! The short spell of lovely weather that we had was quickly mired by the rain and cloud wasn’t it? Did it hamper your weekend plans? Let’s hope the weather improves again soon. 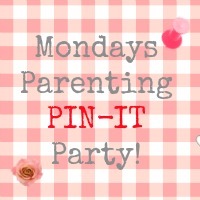 Never mind, the weather won’t stop our party fun and this week we have Carolin from Mummy Alarm hosting this week’s Parenting Pin It Party.